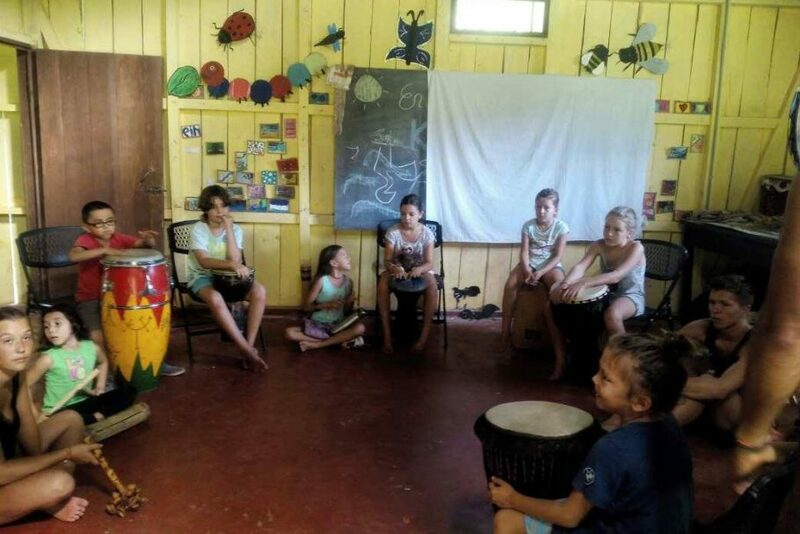 Music workshops, storytelling, theater, games, and agriculture; Kids Club is back in full swing after national vacations in Costa Rica! We were lucky to start off with two guests in the Kids Club, Fernando, a leader of culture and arts in San Jose; and Santiago, a local music teacher in Puerto Viejo. Kids Club started off with a bunch of new silly games, icebreakers, storytelling, and dance with much thanks to Fernando. Many times the Kids Club needs a new face, with different energy to revamp the club, and Fernando did exactly that! I have never seen them pay attention so quickly with someone new, but they were all locked in and interested in what our guest had to offer. Fernando has an amazing way with kids and we hope he will return soon! Santiago came in for a quick music lesson using drums and other percussion instruments in which the kids learned how to use and create different rythms when playing music. Along with the rythms and music, Santiago came up with some silly songs and dances to go along with the music, which the group had an absolute blast with. I always love when we are able to do a music workshop and watch the kids connect with the music and find their own creativity, music can be magical like that, moving the young and old alike. We are hoping to be able to continue to incorporate more music and cultural arts each week to help them grow, learn and most importantly- have fun! 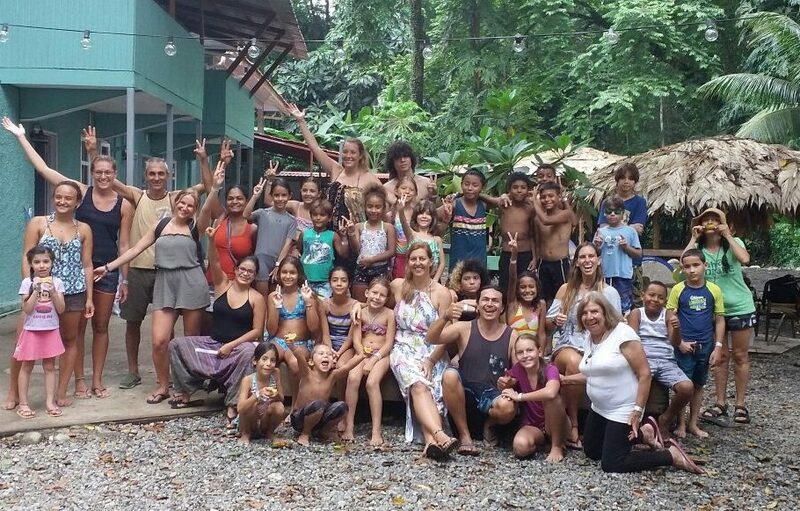 After two weeks of craziness and continuous fun here at Environmental Kids Club, we had a closing celebration in Selinas Hostel with a pool party. 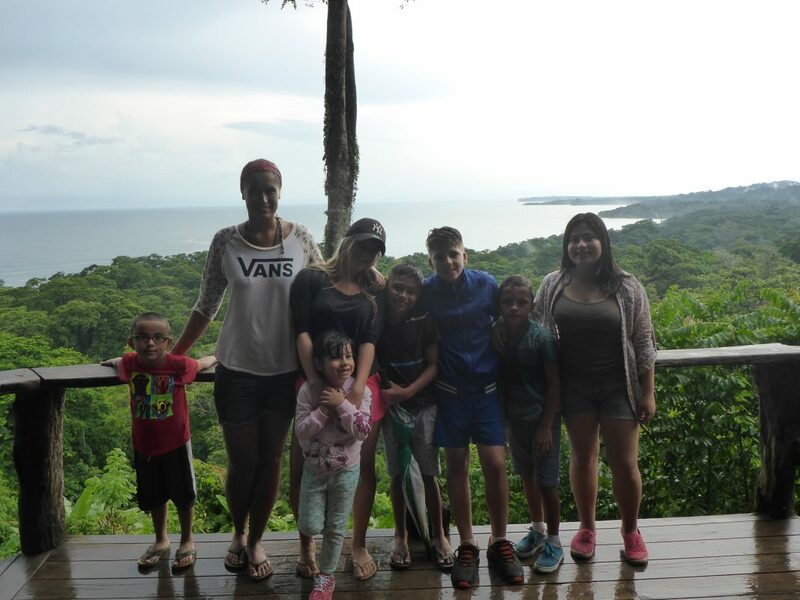 The idea behind our excursions for school vacations was to attract more kids who normally do not come and to give the children of Puerto Viejo a way to make their vacation time count by learning and exploring in creative and fun ways. Through this, we were able to introduce to them ideas about sustainability, recycling, organic farming, cooking healthily, swimming classes, and other excursions intended to have a general lesson behind them. So what better way to celebrate the ending of school vacations at Kids Club than a pool party bash?! 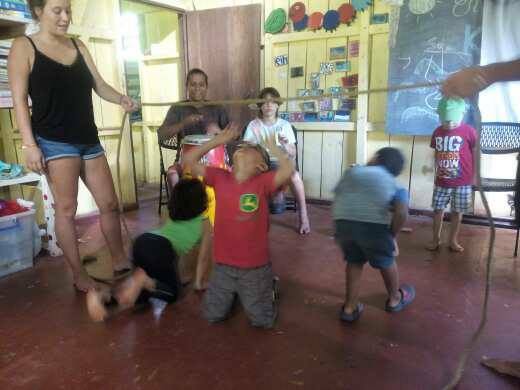 We had water games, pool activities, a treasure hunt and an acro yoga exhibition by one of the kids club participants and their dad. The pool party was a tremendous success, with around 30 kids (some old faces but a lot of new faces too!) who showed up to join the fun! We are so excited about the turn out of kids and the help and collaboration from nearby businesses, vacations may have ended but the beginning of a new chapter in Environmental Kids Club is surely upon us! Planet Conservation would also like to give a big thanks to Selina Hostal for giving us the space to host the party as well as providing us transportation for the kids, also a big thanks to Hone Creek and The Bakery for providing us food and snacks for the Kids Club. On Wednesday of our Environmental Kids Club vacation week, we went on a chocolate tour with the one and only CariBeans. The tour was sponsored by the owner of the CariBeans, which is a really popular place amongst locals and tourists alike to drink coffee and eat locally made organic chocolate. They also offer Tai-Chi, community gatherings such as talks and cacao ceremonies, surf workouts, and unique yoga classes (hint hint, definitely a place you should not miss should you ever visit Puerto Viejo!). We walked through the jungle admiring the greenery as the owner took time to explain every detail of the cacao growing and chocolate making process to our kids. Along the tour, we were lucky enough to see tropical snakes and colorful frogs. 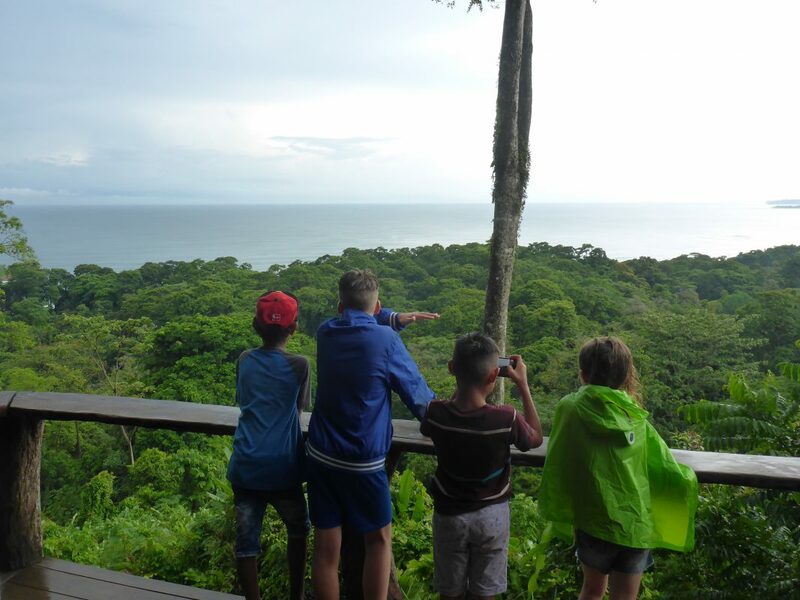 Towards the end of the tour we arrived at the top of a mountain, where we enjoyed an incredible look-out over the treetops and the beautiful coast of Puerto Viejo, the view was definitely one that the Kids and the rest of use will not forget. 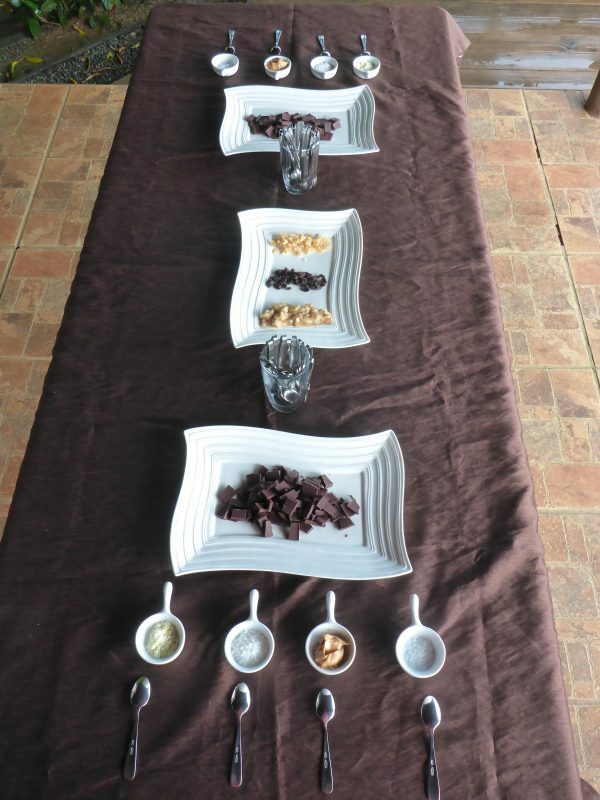 Towards the end, we were able to try the raw cacao and could mix the raw chocolate with several flavors like coconut flakes, sea salt, peanut butter, and milk powder. Everyone adored the chocolate! 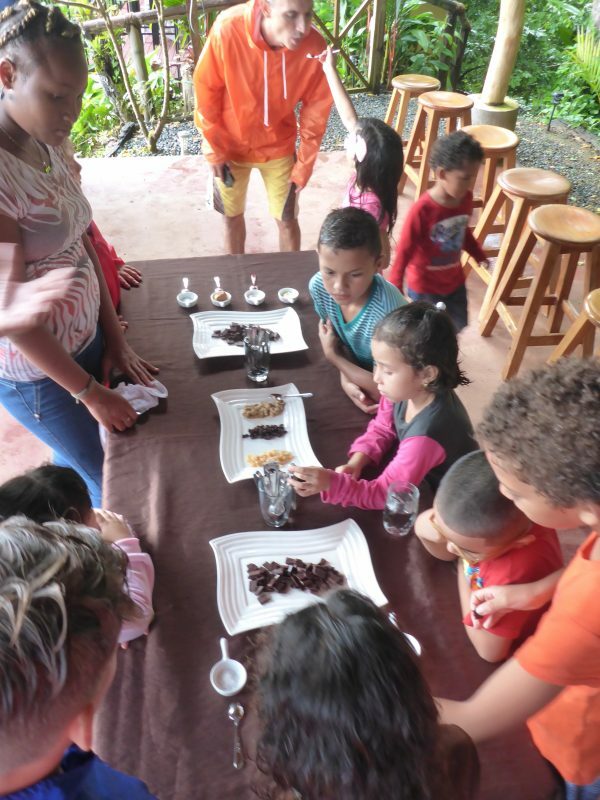 It was very interesting for the kids (and us volunteers) to learn about the process of cacao and how their unique chocolate is made. 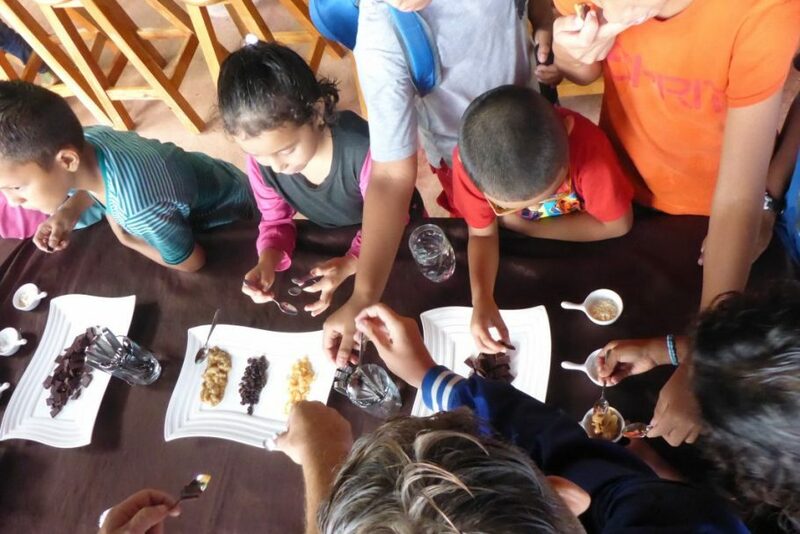 We are very thankful that the CariBeans gave us the chance to learn to learn about the magical world of chocolate. Another successful tour during vacation week at Environmental Kids Club! Another shout out and huge thanks to CariBeans for the tour, Vida Sana Bakery for the lunch, and Outdoors Exploradores for the transportation. We are so grateful for businesses like you that give back our wonderful community of Puerto Viejo! 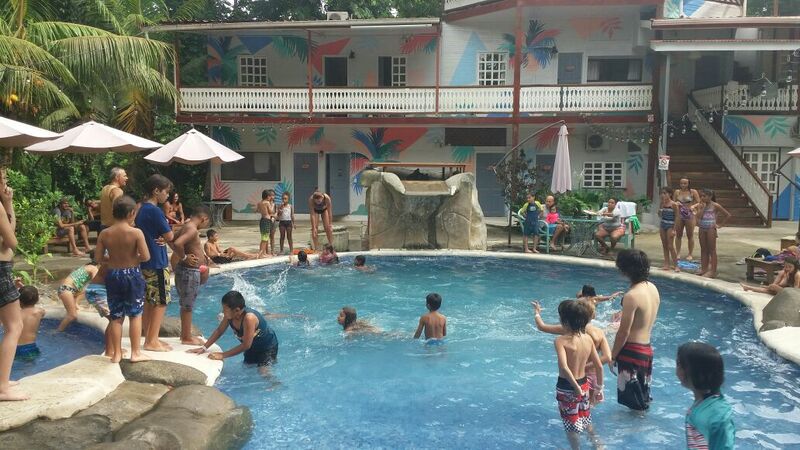 The first day of school vacations in Puerto Viejo, and our first vacation excursion with the Kids Club! 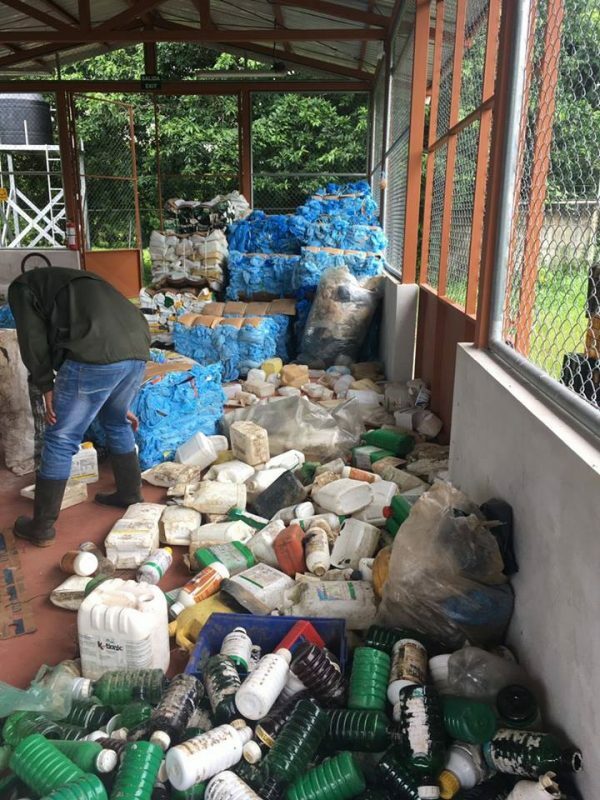 On Monday the 3rd of July we went to a recycling center in Bribri, Costa Rica to put the world’s problem of consumption into a real-life perspective for the kids instead of just always talking about it as an abstract issue. The shuttle took three volunteers and twelve kids to the landfills, where the kids were taught about the recycling process of different materials. 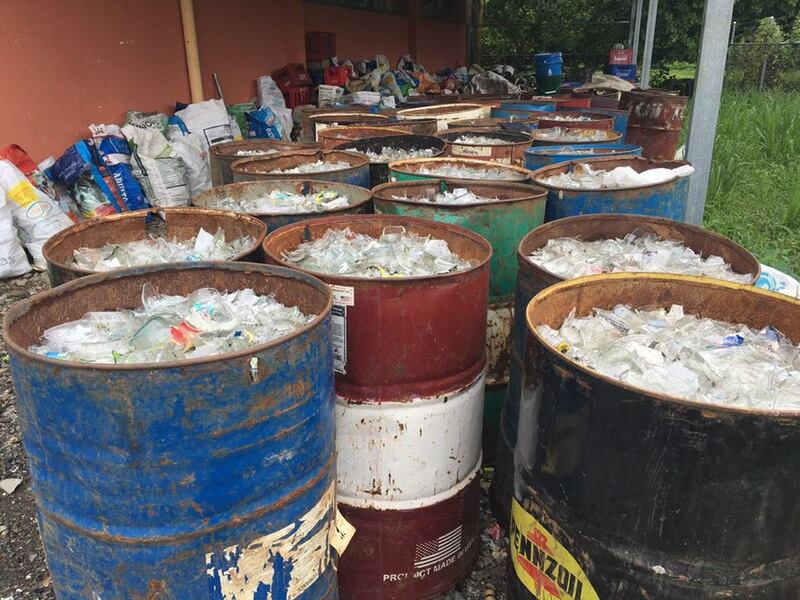 There were mountains of plastic, glass, and cartons, which all comes from Puerto Viejo and nearby towns. The tour was really eye-opening to see where all of our bottles and packaging from our daily garbage goes (which would normally end up in a landfill instead) to be reused and reprocessed. A lesson for everyone and a great kick-start for our two weeks of excursions and fun with the Environmental Kids Club! Stay tuned for more updates of what we will be up to these next couple of weeks! Planet Conservation owes a big thanks to Exploradores Outdoors and Terraventuras for the free transportation to and from the recycling site. Also, another big shout out to PanPay for the food donation so that we could all enjoy a pleasant lunch with the kids! We are so thankful for their support and contributions!